Depending on which state you live in as well as which state you work in, there will be different procedures for filing a workers' compensation claim. Most states use a third party private insurance company to handle workers' compensation. While there may be specific forms issued by the state to file a claim, usually the claim is filed by either the injured employee or his employer directly with the insurance company. In this situation the state's review board typically acts as a mediator between the injured worker and the insurance company when a claim is denied or requires further investigation. 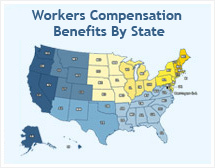 Some state governments operate their own workers' compensation programs. In this situation a claim is usually filed by the injured employee or by her employer directly with the state's workers' compensation review board. In this situation the state will evaluate the claim and either award compensation, request further documentation, or deny the claim. Regardless of which process is used in your state, you may always appeal a denied claim. If you are filing a claim or have a claim that has been denied you are eligible for a free consultation with a legal professional to evaluate the status of your case. When you have been injured on the job, after you have received adequate first aid, alert your employer as soon as possible that you have been injured and that you wish to file a workers' compensation claim. This is always the first step in the process. Frequently, the next step is seeking professional legal counsel to navigate the difficulties of the claims process. For a free evaluation of your workers' compensation claim, click here.